So many people see us traveling with our 4 young kids and the typical response is, "oh man...I feel for ya!" What? What does that even mean? Do people not enjoy spending time with their kids anymore? Why does everyone assume that bringing them along on our adventure equals pain and suffering and despair? Honestly, I'm fed up with this attitude. I just don't get it. And I'm growing weary of the assumption that our kids are exhausting, overwhelming, demanding, soul-sucking and life-wrecking. I'm also tired of the mindset that all parents have a God-given right to be child free for at least 3 hours a day so they can maintain their sanity. Grandparents, churches and pre-schools are all getting pulled into this and I think it's a real shame. Because while I can totally relate to needing the occasional break from all the noise and craziness, I also could never imagine my life without these 4 beautiful blessings by my side everyday. Listen, I understand everyone's circumstances are different. Single parents have to work, and sometimes both parents need to make ends meet. But I want to encourage you to relish the time you get to spend with your kids - not dread it. If I see one more "I'm so excited my kids are going back to school they were ruining my life" status updates on Facebook I'm going to scream (sorry Jen Hatmaker). Is it hard to be with your kids all day? No, not really. I've found that the more I'm away from my kids the harder it is for me to tolerate their loud shenanigans. Since we started this full-time travel thing and we're together all the time, I honestly don't think about going away that often. While I do appreciate the few times I've gone to the grocery without all 4 in tow, it's also not that big of a deal if I end up taking them with me. In fact, instead of complaining about having them with me I've been trying to pay attention to them more. Here are a few things I have learned from being around my kids all day, everyday. 1.) THEY ARE KIND & FORGIVING. Sometimes when I'm having a bad day and I loose my cool over something stupid, they are really quick to accept my apology and forgive me. They often will give me a hug soon after my blow up and tell me that they love me and you know, that is so awesome! Thanks to them I'm learning to forgive faster. I see them interact with people of all ages. They aren't afraid to have a conversation with an adult and they play and talk to kids of all ages. So many people worry about 'socialization' of homeschool kids. Our kids have played with lots of people while we have been on the road and they are learning to include anyone, not just whoever looks cool or whoever is around the same age as them. This, I am sure was not learned from us. I sometimes think that our kids are way more social than we are. They're teaching us to get out of our comfort zone and talk to people we don't know. 3.) THEY LEARN THROUGH PLAY & TRAVEL. Guess what! My kids have interests! And guess what else!! We can make any kind of 'lesson plans' out of what their interest are at the time. Ada is crazy about ponies. So, we talk about the colors of the ponies, and how many there are and what happens if one of them goes away? How many are left? What do ponies eat? Where does thier food come from? How much does a pony cost? I could go on and on. Adali want's to run a farm. So, we research all about how to take care of the animals that she wants to have on her farm. How much would it cost to feed all of them for a month? How do you care for the animals? How much would it cost to build a barn? Where would your farm be? What's the weather like there? How would you make money having a farm? What could you give to the community if you had an awesome farm? How would you make it awesome and unlike any other farm so that people would want to come visit your farm? This is teaching us how important it is that learning comes naturally. Investing in their interests and helping them understand what it would take to make thier dreams come true is really important. Also, we've started to see how to use situations and cicrumstances to learn and get better, not complain and criticize. I thought it may be hard for our kids to adjust to life on the road but you know what? We have seen them thrive. They have come out of their shell. They are getting along better than ever. They talk more to others than they ever have. They are learning to do more things on their own and they are quick to help each other out when they see someone struggling. Do they miss their extended family and friends? Of course. But we encourage them to write letters and to text them. They are constantly learning and I think parents these days see play as a waste of time whereas most kids who are playing are actually learning important skills. So - in my completely unprofessional opinion, it's far more valuable to be with your kids as much as possible than to ship them off multiple days a week for some "me-time." You know, your kids are there because you CHOSE to have them. So, why not invest as much time as you possibly can into thier lives?They want to learn from YOU. They want to be around YOU. I bet if you asked your kids who they wanted to spend time with today, the answer would be, "Can you play with me, mommy/daddy?" You have such little time with them in the grand scheme of things. 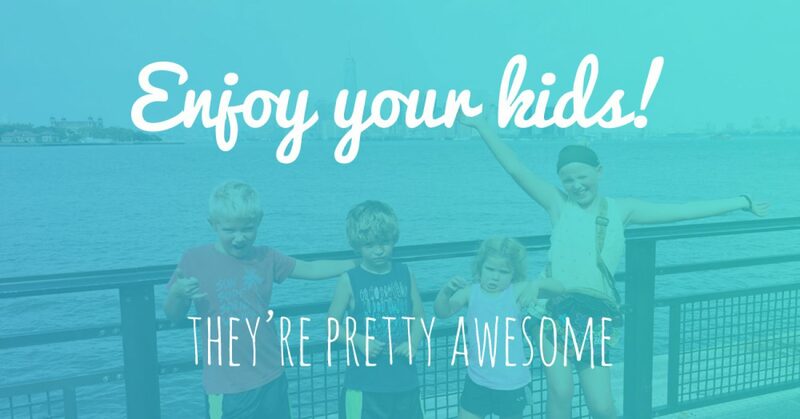 So please, ENJOY your kids! Put down the phone! Get outside and let them play in mud puddles. Let them dress themselves. Say yes more often. Don't rush them! Encourage them every day! And for pete's sake, GIVE THEM LOTS OF HUGS! They're only little for a short time. Enjoy it.